I like squash, but before this year I’d rarely made it at home. The thing is that it takes a while to prepare, and when we’re talking putting dinner on the table, I’m a quicker-is-better kind of chef. But I’m trying to remain open to new things, and I was inspired by a couple of pretty Pinterest pins and my best friend’s example (she made spaghetti squash lasagna). 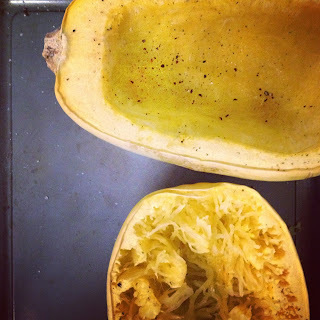 So, this is my first go at spaghetti squash. I’ll be back for more, because it was delicious. Cut squash in half and remove seeds. Place squash halves open side up in a roasting dish or on a cookie sheet. Brush each side with one tablespoon olive oil, then sprinkle salt and pepper. Roast in oven for 45 minutes. Prep the onion, tomato, basil and goat cheese, and mix together in a small bowl. When squash has finished roasting, take out of the oven and fluff the squash ‘meat’ until spaghetti-like strands appear. Fill each side with half of the goat cheese mixture, drizzle with remaining olive oil, and sprinkle generously with salt, pepper and paprika. Return squash to oven for 15 minutes. After that, turn oven on Broil setting and roast for another 5 minutes. When finished broiling, take out, let cool for a couple of minutes, and serve! Makes 2 generous portions. The basil, tomato and cheese combo gives this dish a little summery flare, but it is definitely a filling comfort food when all assembled. 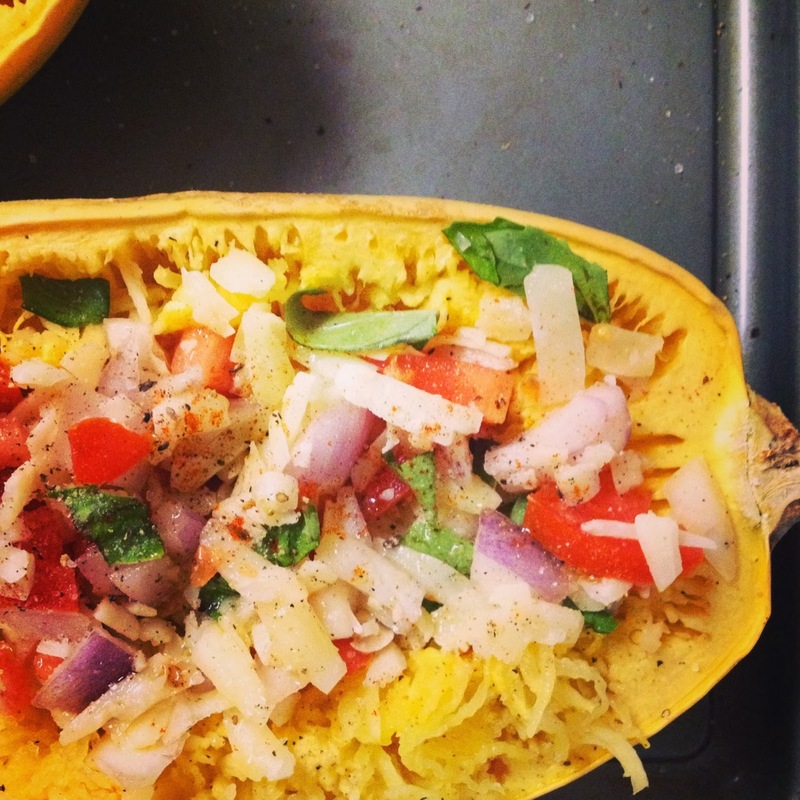 Half of the squash felt like a large portion – you won’t need anything else on the plate. Recommended for: anyone craving a late fall dish that has a nice bite of fresh flavor, and fans of simple vegetarian comfort food. I just saw the photo on instagram and was hoping you'd have the recipe posted for Weekend Cooking - thanks! That turned out to be a beautiful dish! Sounds delicious, too. I love how versatile spaghetti squash is. Now I'm kicking myself for not buying a spaghetti squash this week; this looks soooooo good. I tried a spaghetti squash this fall and did NOT love the flavor. 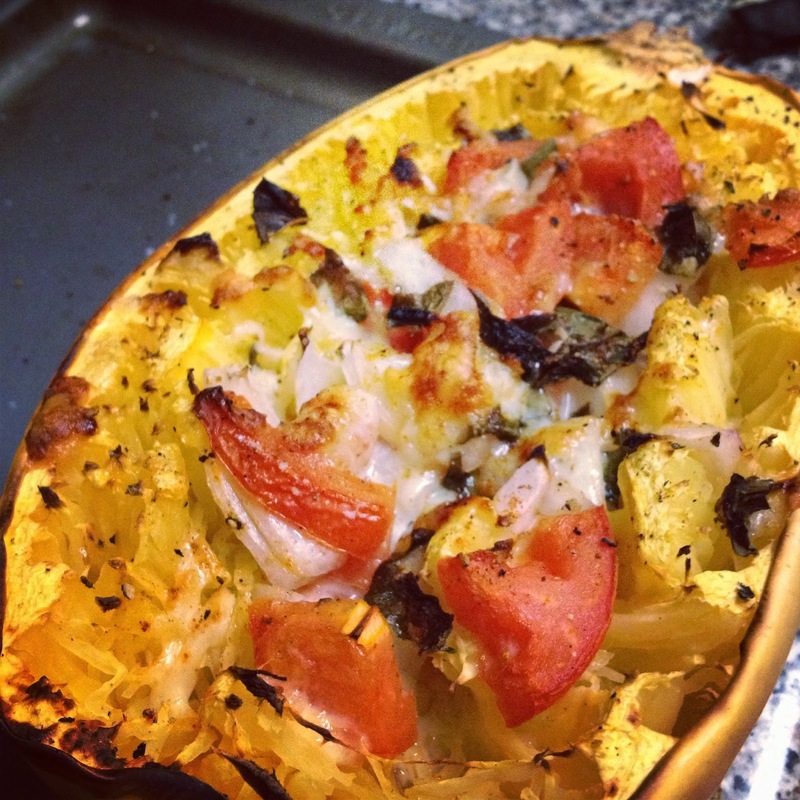 This recipe might work though as you are adding some deliciousness right into the squash. 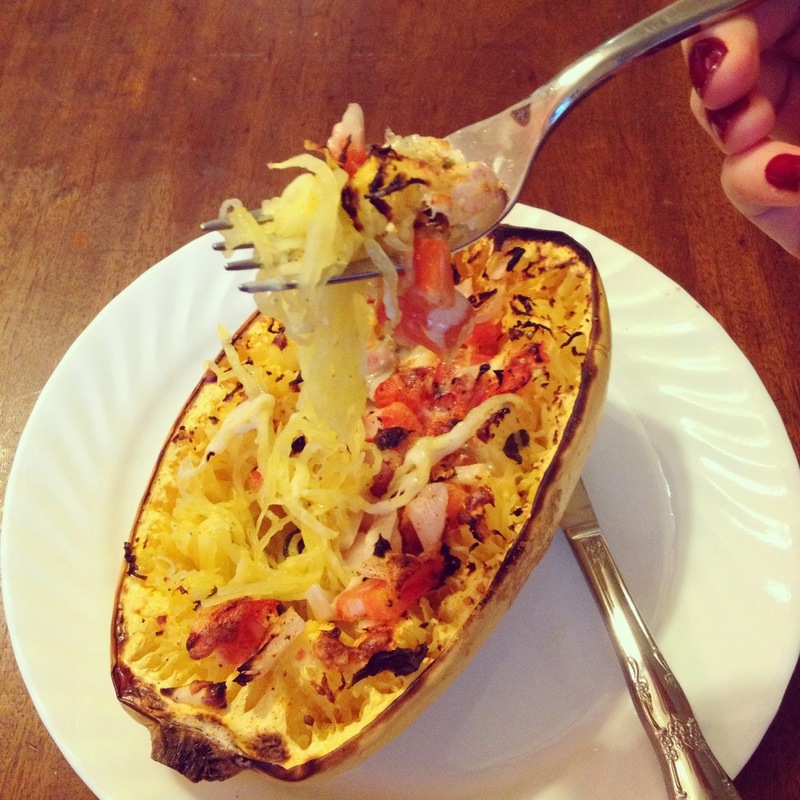 this sounds delicious, I love spaghetti squash. This looks amazing!! I use squash in a lot of dishes. I put it in chili today. But I have never made spaghetti squash. I think this might be the recipe I go to when I finally do cook it!